Learn ways to get cheap magazine subscriptions, to save you money. Because who doesn't like to curl up in bed, on the sofa, or even on the throne with a good magazine ☺. Well, if you’re still purchasing your publications at the checkout counters and newsstands, quit it! You’re paying the full cover price. For me, those magazines are at the check-out for one reason, to scan while I’m waiting in line, then to put back when it’s my turn up to bat. And shamelessly, it’s usually the tabloids that catch my attention -- but I’ve never purchased one (no really). But still, I get to see the occasional two-headed alien or photo that confirms that Big Foot (or a man in a gorilla suit) really exists. Bottom line, have your magazines mailed to you, or get them on a mobile device, by a discounter and save big! If you still purchase some of your magazines at the newsstand, at least use a coupon. You can get coupons for many popular magazines here. As I find great deals on magazines, I will feature them here on this site for you. Other than the ones mentioned below, there is a section of limited-time Current Magazine Specials shown in the right column of this website. I also list free magazine offers in the daily Freebies and Deals blog when they become available. They offer great prices on magazines and no subscription auto renewals. 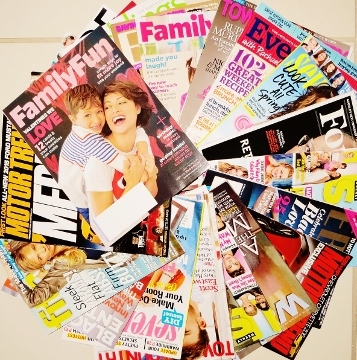 Major titles of magazines at discount prices, with no automatic renewals. It might not be the first place you would think of for Magazine Subscriptions, but they actually have some pretty good prices. If you can't locate a magazine that you want at one of the sources that I mentioned above, you might want to check them out. They actually have some great $5 and $10 deals. Be sure to check to see if your subscription automatically signs you up for auto-renewal. Sometimes, if you're getting a really great rate on a magazine, this will be one of the conditions of the offer. Don't make it a stop-gap to your deal though. All you need to do is make certain that you put a self-reminder in place, so that you can cancel your subscription around 1 month before the subscription ends (unless you wish to renew). You can place the reminder on a computer calendar (like Microsoft Outlook) that will pop-up and remind you, or a desk calendar (if you view it often), or on a sticky note on the Garage door where you exit each day. Place the reminder in the slot with your bills or wherever you keep your Birthday/Anniversary reminders. Just be certain to do it the VERY DAY THAT YOU SUBSCRIBE or you may forget! After subscribing, you will receive renewal offers or requests in the mail. Now, if you paid a discounted rate for your first subscription and the renewal rate matches or is lower than the first rate you paid, then renew if you like the magazine or publication. Be sure to shred or tear up all offers that you don’t accept. Don’t just toss them in the trash. And be leery of counterfeit renewal offers - these are offers that didn't come from the initial publishing house that you signed up with. Sometimes counterfeiters will send in renewal offers hoping that you don't know the expiration date of your subscription, and they'll get you to subscribe again. This little trick was recently in the media. You'll find yourself paying for the same magazine twice, because you accidentally renewed with one of those counterfeiters that snuck in the back door, and your original subscription doesn't even expire for 6 months. Now you've got two of the same magazine coming each month. Yipes! Here's how to avoid these scammers. You can always look at your last issue of a magazine to see when your subscription expires. Most all subscription expiration dates are listed just above your name on the label.